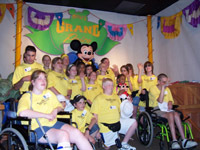 In 2005 the Keystone Kids were the first group of students who are blind and visually impaired to participate in the Youth Education Series (YES) at Disney World in Orlando, Florida. This was a life-changing experience for many of the children, as well as a valuable learning experience for the YES staff at Disney World. A 2008 trip to Toronto and Niagara Falls afforded the children the opportunity to experience the majesty and power of Niagara Falls firsthand as the Maid of the Mist delivered them to the foot of the falls. The group also enjoyed VIP treatment at The Medieval Times Dinner Theatre and got to touch the Stanley Cup at the Hockey Hall of Fame. 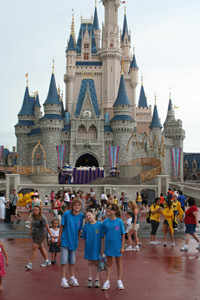 A new group of Keystone Kids got to experience Disney behind the scenes during our 2010 Disney World trip. This time, thanks to the groundbreaking work we began with our first trip in 2005,we found the YES programs were adapted more directly for students with visual impairments. At Gatorland, the children learned more about the animals and habitat of the Florida Everglades and even got to pet a live alligator! The benefit of these trips goes beyond the exciting and unique experience of visiting tourist attractions. For many students, this is the first time to travel away from home without their parents. Flying on an airplane, staying in a hotel, eating in restaurants and using public transportation, all provide opportunities to build upon self-help skills and independence. Children take an active role in fundraising and preparing for these trips. Each child is responsible for fund-raising a portion of the cost of their trip. There are also group activities aimed at building camaraderie among the children and direct instruction in the areas of daily-living skills that they will need on the trip. If you are interested in participating in future extended field trips with the Keystone Kids contact us for more information about starting an affiliated program.